Help! Will My Grandchildren Be Catholic? My daughter just got engaged to a Catholic man. He is a fine gentleman, extremely respectful, and we get along well. She recently let us know that after a long discussion she accepted his request that their future children be raised Catholic. She herself will remain a Jew and they will join our family for the important Jewish holidays, along with the occasional Shabbat dinner. She indicated that if she didn’t accept the children being raised Catholic the engagement would more than likely not happen. It was a deal breaker for him and his religious family. My daughter had hoped that the children, as my wife and I hoped, would be raised interfaith. We are not very observant, but have a strong Jewish identity that means a lot to us. We live close to our daughter and her fiancé and she has repeatedly stated that my wife and I will be a big part of their family’s life. Now I am going through emotional turmoil and need advice. Is there anything I can do to get them to reconsider raising their future children with a little less emphasis on the one religion? Here’s the thing: your grandchildren WILL be raised interfaith. By nature of living in a home with a Jewish mom, they will be touched and influenced by Jewish culture and thinking daily. I promise you this! 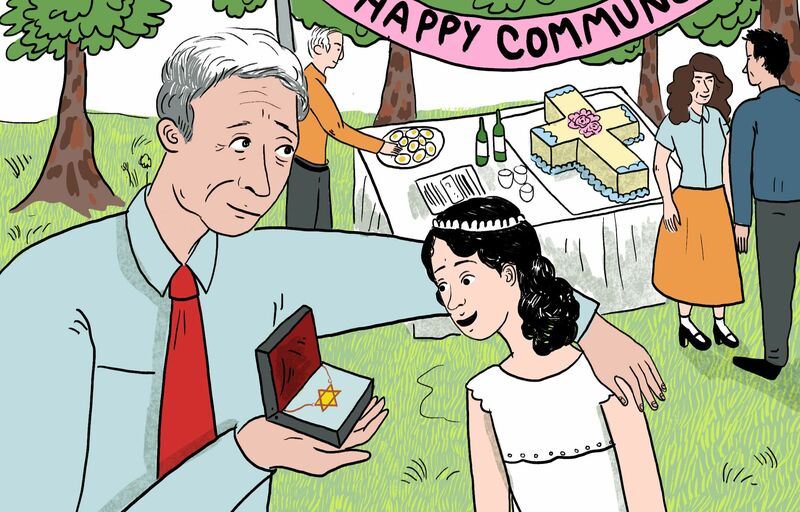 And the more that you—as grandparents—can model the wonderfulness of Judaism, how much it means to you, in your home—the more it will be a force for good in their lives. No amount of Sunday school training will undo the allure of a Shabbat table, shining with candles, or the fun of helping build a Sukkah or hunting the affikomen. Those memories will stay with your grandchildren all their lives. The more you do the work and live out your own joy in Judaism, the more they will absorb and adopt the “strong Jewish identity” you value. Regardless of elementary school theology. I would suggest that you cannot “get them to reconsider” because honestly, it isn’t your job. Though your daughter clearly wishes things were different, she doesn’t wish it enough to leave this man, who by all accounts will be a great husband. What this tells me is that her own Judaism is more cultural and less devout, and she knows it. I applaud her for engaging with this conversation directly, facing down these issues before marriage, and being honest with you about the situation. She’s walking into a new chapter with her eyes open. That’s very brave! But in the end, it doesn’t actually sound like your “not very observant” Judaism/identity is in real conflict with Catholicism, religiously. It sounds more like you’re uncomfortable with this other world. That makes sense! It will be hard for you to adjust. You’ll have to sit through baptisms and first communions, and that will be unfamiliar. But the best thing you can do, in my opinion, is grow. Do your best to truly embrace your own entrance into interfaith family life. If you bring your sense of conflict into this, I fear it will ripple into what “Judaism” means for this new family. And have the opposite effect from the one you’re seeking. These kids are going to have formal religious instruction in Catholicism. You get to give them a less formal education in the joys of being Jewish.